It is always interesting to be on the other side of a desk. I consult and write on “all things” insurance, but I’m not always buying insurance. This year I purchased a couple of new policies, causing me to complete new applications. It was an experience that once again convinced me the industry must purposely want a poor reputation. At the very least, it creates opportunities for new competitors. Poorly worded questions and poorly designed applications create frictional costs for carriers and can impact their reputations, says consultant Chris Burand, noting that most of this can be avoided if an organization takes time upfront to think about what the questions mean from the consumer’s perspective. For example, some questions on the applications were just ludicrous. One question was, “Is the risk subject to a catastrophe?” If catastrophe is not an exposure, most people really do not need insurance. Of course, my account is subject to catastrophe. Every risk has a catastrophe exposure. Maybe it would have helped to define catastrophe, but the application did not do so. (Understand, the question had nothing to do with living on a coast.) What an absolutely nonsensical, stupid question. Other questions were so poorly written that I had no idea what was being asked. I have made a living in this industry for 30 years, and if the questions made no sense to me, I cannot imagine what normal people would think. One question requested audited financials. The vast majority of businesses do not have audited financials. The company only wanted the financials if audited, and yet most of their prospects won’t have audited financials. One has to wonder if they really want the business or not. Alternatively, do they know what they’re doing? Other questions were so terribly designed that a truly proper answer could not be proffered. I know the people who design applications try hard, and they are probably smart, but if I, someone with decades of experience working at fairly high levels within the industry, cannot understand the application’s questions, why should anyone expect regular consumers to understand or even answer the questions correctly? Anyone with such expectations is thinking unreasonably. I think what happens is the carrier or the firm designing the application is just too close to the situation. I will offer to be that outside purveyor to fix this because it needs fixing. For example, one question asked if I wanted a specific coverage. However, the application did not offer a place to answer the question. There was not a box or a place to circle “yes” or “no.” The application must have had 40 other “yes/no” options, but nothing for this optional coverage. Moreover, I would not have been applying for that coverage if not for that specific option. The policy was otherwise of minimal value. On the other hand, some of the “yes/no” questions could not be answered honestly and/or correctly with a “yes/no” response. The situation was like a deposition or trial when an attorney asks for a “yes/no” response and neither “yes” nor “no” is a correct answer. In those situations, the attorney is usually attempting to create a trap. So when I, and other people, see such a question, it seems like a trap or incompetence because maybe the carrier does not really understand what they are asking, or they are asking the question in such a way they know the answer will be wrong and then can deny the claim. Either way, distrust is created. The industry’s reputation is tarnished. And a liability exposure is created. The problem with poorly worded questions and poorly designed applications is these situations give companies more potential outs for paying claims. They can advise a question was answered improperly and therefore deny coverage. I am sure (not really) this never happens, but insureds see it as a trap. I am not writing about rocket science. The consumer understands a well-designed application is not rocket science, so they see a stupid question or a trap and think the worst. Especially when the consumer asks their CPCU agent about the question and even the agent cannot answer. These situations create multiple problems for agents. It causes them to take more time writing new accounts because they have to explain more. It creates significant E&O exposures because people hurry or give poor advice to get through the questions and hope the underwriter does not follow up. It helps rush the industry to a commodity because agents oversimplify to get through the process without the client’s eyes glazing over. For example, asking questions like: “Are you in compliance with [name the regulation or law]?” That is a legal question. I may think I am in compliance, but I have not read the 500 pages of applicable regulations specific to whatever category. I have not gone to law school to know how to interpret those 500 pages. I am not an attorney, and I do not have a law license required to offer a legal opinion, but that is what the question requires—a legal opinion offered by people without law degrees. It makes no sense. A common and specific example of this is the often-asked question, “Are you in compliance holding PII data securely?” Not only are those regulations complex, but multiple definitions of PII information exist. Sometimes the policy (which is almost never provided with the application) gives a definition. The application never gives a definition. That definition may not be the same in the rules. Sometimes different government entities use different definitions. When the application asks if the applicant is compliant with PII security, to which definition of PII data are they referring? Poorly designed applications create frictional costs for carriers. Every call an agent makes to an underwriter asking for more information or an explanation is a cost. A good application saves everyone money and frustration. Poor reputations cost companies because it costs more to convince people to purchase insurance. Poor reputations and questionable applications increase exposures and lawsuits. Most of this can be avoided if an organization takes time upfront to think about what the questions mean from the consumer’s perspective. Maybe the best way to do this is to get outside help from someone not so close to the forest they cannot see the trees. 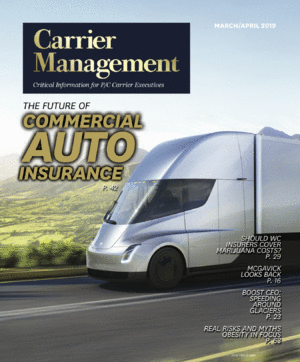 *This article first appeared on InsuranceJournal.com, CM’s sister publication. Chris Burand is president of Burand & Associates LLC, an insurance agency consulting firm. Reach Chris at chris@burand-associates.com.